Fig. 2.7. Diagrams illustrating the local circuit theory. The upper sketch represents a non-myelinated nerve fibre, the lower sketch a myelinated fibre. From Hodgkin (1958). excitation, that is to say the way in which the impulse is set up in nerve and muscle fibres. 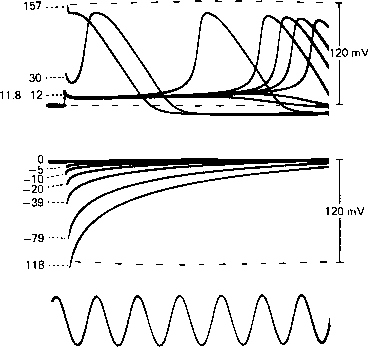 This order of treatment is, historically, that in which research on the subject developed, because progress towards a proper understanding of the details of the conduction mechanism was inevitably slow before the introduction of intracellular recording techniques, whereas excitation could be investigated with comparatively simple methods such as observing whether or not a muscle was induced to twitch. 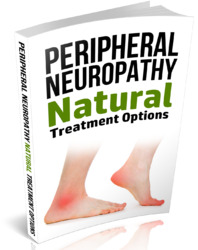 Although a nerve can be stimulated by the local application of a number of agents — for example, electric current, pressure, heat, or solutions containing substances like KCl — it is most easily and conveniently stimulated by applying electric shocks. The most effective electric current is one which flows outwards across the membrane and so depolarizes it, that is to say reduces the size of the resting potential. The other agents listed above also act by causing a depolarization, pressure and heat doing so by damaging the membrane. A flow of current in the appropriate direction may be brought about either by applying a negative voltage pulse to a nearby electrode, making it cathodal, or through local circuit action when an impulse set up further along the fibre reaches the stretch of membrane under consideration. It was suggested long ago that propagation of an impulse depends essentially on the flow of current in local circuits ahead of the active region which depolarizes the resting membrane, and causes it in turn to become active. The local circuit theory is illustrated in Fig. 2.7, which shows how current flowing from region A to region B in a non-myelinated fibre (upper diagram) results in movement of the active region towards the right. There are important differences that will be discussed later (see p. 79) between the current pathways in non-myelinated nerves or in muscle fibres on the one hand, and in myelinated fibres on the other (lower diagram), but the basic principle is the same in each case. The role of local circuits in the conduction of impulses has been accepted for some time, and is mentioned at this point in order to emphasize that in studying the effect of applied electric currents we are not concerned with a non-physiological and purely artificial way of setting up a nervous impulse, but are examining a process which forms an integral part of the normal mechanism of propagation. The first concept that must be understood is that of a threshold stimulus. The smallest voltage which gives rise to a just perceptible muscle twitch is the minimal or threshold stimulus. It is the voltage which is just large enough to stimulate one of the nerve fibres, and hence to cause contraction of the muscle fibres to which it is connected. If the nerve consisted only of a single fibre, it would be found that a further increase in the applied voltage would not make the twitch any stronger. This is because conduction is an all-or-nothing phenomenon: the stimulus either (if it is subthreshold) fails to set up an impulse, or (if it is threshold or above) sets up a full-sized impulse. No response of an intermediate size can be obtained by varying the stimulus strength, though of course the response may change if certain external conditions, for example temperature or ionic environment, are altered. In a multi-fibre preparation like the sciatic nerve there are hundreds of fibres whose thresholds are spread over quite a wide range of voltages. Hence an increase in stimulus strength above that which just excites the fibre with the lowest threshold results in excitation of more and more fibres, with a corresponding increase in the size of the muscle twitch. When the point is reached where the twitch ceases to increase any further, it can be taken that all the fibres in the nerve trunk are being triggered. This requires a maximal stimulus. A still larger (supra-maximal) shock does not produce a larger twitch. Fig. 2.8. Threshold behaviour of the membrane potential in a squid giant axon at 6°C. Shocks, whose strengths in nanocoulombs/cm2 membrane are shown against each trace, were applied to an internal wire electrode with a bare portion 15 mm long. The internal potential was recorded between a second wire 7 mm long opposite the centre of the stimulating wire and an electrode in the sea water outside. Depolarization is shown upwards. From Hodgkin, Huxley and Katz (1952). of the figure shows that when the direction of the shock was reversed to give inward current which polarized the membrane beyond the resting level, the displacement of the potential then decayed exponentially back to the resting value. The changes in the ionic permeability of the membrane that are responsible for this behaviour are explained in Chapter 3. Fig. 2.9. 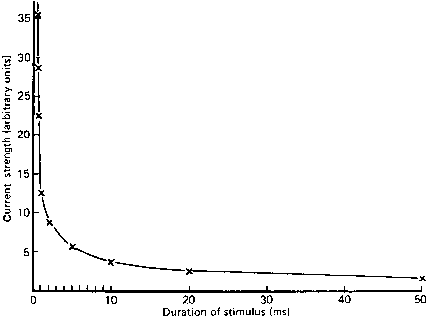 The strength-duration curve for direct stimulation of a frog's sartorius muscle. From Rushton (1933). critical level whose existence is shown clearly by Fig. 2.8. 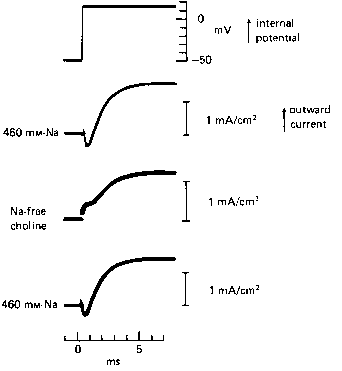 When the shock duration is reduced, more current must flow outwards if the membrane potential is to attain this critical level before the end of the shock. It follows that for short shocks a roughly constant total quantity of electricity has to be applied, and in Fig. 2.8 the shock strength was therefore expressed in nanocoulombs/cm2 membrane. For a short period after the passage of an impulse, the threshold for stimulation is raised, so that if a nerve is stimulated twice in quick succession, it may not respond to the second stimulus. The absolute refractory period is the brief interval after a successful stimulus when no second shock, however large, can elicit another spike. Its duration is roughly equal to that of the spike, which in mammalian A fibres at body temperature is of the order of 0.4 ms, or in frog nerve at 15°C is about 2 ms. It is followed by the relative refractory period, during which a second response can be obtained if a strong enough shock is applied. This in turn is sometimes succeeded by a phase of supernormality when the excitability may be slightly greater than normal. Fig. 2. 10 illustrates the time course of the changes in excitability (= 1/threshold) in a frog sciatic nerve after the passage of an action potential. Fig. 2.10. Time course of the recovery of excitability (= 1/threshold) in a frog's sciatic nerve after passage of an impulse. The conditioning stimulus and the test stimulus were applied at electrodes 15 mm apart, so that about 0.5 ms should be subtracted from each reading to obtain.the course of recovery under the test electrode. The absolute refractory period lasted 2 ms, and the relative refractory period 10 ms; they were succeeded by a supernormal period lasting 20 ms. From Adrian and Lucas (1912). 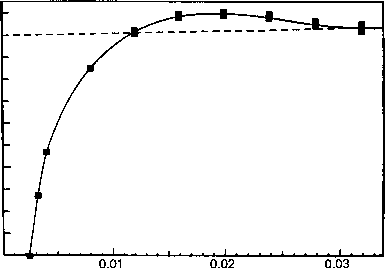 The refractoriness of a nerve after conducting an impulse sets an upper limit to spike frequency. During the relative refractory period, both the spike size and the conduction velocity are subnormal as well as the excitability, so that two impulses traversing a long length of nerve must be separated by a minimum interval if the second one is to be full-sized. A mammalian A fibre can conduct up to 1000 impulses/s, but the spikes would be small and would decline further during sustained stimulation. In A fibres, recovery is complete after about 3 ms, so that the frequency limit for full-sized spikes is 300/s. Even this repetition rate is not often attained in the living animal, though certain sensory nerves may exceed it occasionally for short bursts of impulses. How membranous cell excitation after giving impulse?